Did a 19th century novel inspire a group of Nazi UFO hunters? There are lots of rumors and legends about the Vril Society, an occult Nazi group that may have existed in pre-World War II Germany. Did these seekers after arcane truths take their name and beliefs from a 19th century science fiction novel by one of the most notorious bad writers of all time? Let's examine the evidence! One of the earliest science fiction novels, The Coming Race revolves around refugees from Atlantis who flee to the core of Earth after the destruction of their fabled city. While underground, the former Atlanteans come into contact with a powerful energy source, Vril. And in time they master the use of Vril, using the energy source to heal illness and potentially wage war with surface dwellers. Edward Bulwer-Lytton is best known for The Last Days of Pompeii, which he wrote four decades before The Coming Race while serving as a member of Parliament. This well regarded piece of historical fiction probably helped inspire and inform the fictional The Coming Race. And maybe for that reason, a number of readers accepted parts of Bulwer-Lytton's novel as fact, taking to heart the existence of subterranean groups living in a hollow planet and the energy conduit Vril. Hollow Earth theories persisted well into the late 19th Century — so tales of a subterranean race under the planet’s crust would not be to far from the norm. The core of the Earth would not be fully understood for decades, until Danish seismologist Inge Lehmann's keen observations following a 1929 earthquake off the coast of New Zealand provided evidence of material filling the core of the planet, and ended the scientific possibility of a hollow planet. In the immediate decades after the release of The Coming Race, a number of authors of fiction and non-fiction included the occult energy source Vril in their work, with William Scott-Elliot attributing the power of Vril to Atlanteans in 1896’s pseudo-historical The Story of Atlantis. People often talk about the love for occult lore among the Nazi inner circle in the 1930s and 1940s. Often, there are tales of Aryan-friendly aliens who visited Earth thousands of years ago. Did a group of Nazis take The Coming Race too seriously, and create the Vril Society in hopes of controlling Vril energy? At the center of this rumored Vril Society is Maria Orsitch — a woman who is typically connected to the well-documented Thule Society, a German group fascinated with the occult that started a rise to popularity in 1918. Orsitch claimed to have the ability to speak with an Aryan race of aliens who were powered by Vril, and through this connection desired to unite the Thule and Vril Societies in finding the energy source Vril within Earth and creating disc-shaped spacecraft that would reach the aliens’ home planet of Aldebaran. The existence of a separate Vril Society is often disputed, due to a lack of firm evidence. However, proponents of the groups’s historical authenticity claim that the Vril Society acted as a state-funded occult think tank, tasked with creating flying saucers or finding existing ones to take up the Nazi war cause during World War II. And some of those who believe the Vril Society actually existed also believe the UFOs carried key members of the party to Antarctica, South America, and into space to continue their work after the defeat of Germany and the Axis Powers in World War II. An imaginary group for an imaginary tale? There is one large piece of evidence missing to document the Vril Society – no contemporaneous reference to the group exists. The first reference comes to the Vril Society comes via Pseudoscience in Naziland, a 1947 article by German rocket scientist and author William Ley published in the magazine Astounding Science Fiction. That group which I think called itself Wahrheitsgesellschaft — Society for Truth — and which was more or less localized in Berlin, devoted its spare time looking for Vril. Yes, their convictions were founded upon Bulwer-Lytton's The Corning Race. They knew that the book was fiction, [but believed] Bulwer-Lytton had used that device in order to be able to tell the truth about this "power." A second early reference comes in The Morning of Magicians, a seminal occult summary text published in 1960. In the book the authors suggest the Vril Society existed as an inner circle of the Thule Society. Although these two references are intriguing, they are separated by decades from the alleged height of the Vril Society, in the 1920s and 1930s. A single piece of contemporaneous evidence (notes from a meeting, a list of members, etc.) supporting the existence of the Vril society would go a long way in cementing the existence of the group. Until this evidence is uncovered, the Vril Society is relegated to the genre of its source material: fiction. 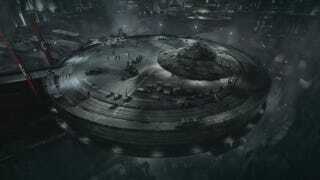 The top image and additional image is from the 2012 movie Iron Sky by Entertainment One. Cover of the comic book adaptation of The Last Days of Pompeii is courtesy of the Grand Comics Database. The full text of The Coming Race is now within the public domain.